Despite a cold and dry beginning and end, the balance of December was unusually mild and rather active, which made the month as a whole notably warmer than normal. In fact, Prosser's mean monthly high of 42.7 degrees was the second warmest on record, and trailed only 1999. Mt. Vernon reached a record warm December temperature of 66 degrees on the 10th, while 1.65 inches of rain fell at Long Beach on the same day. 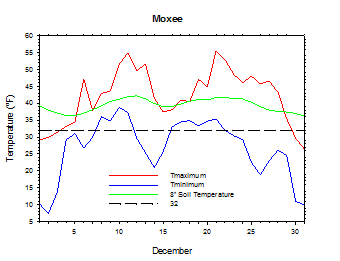 Temperatures were below normal early in the month, as Moxee fell to just 7 degrees on the 2nd. 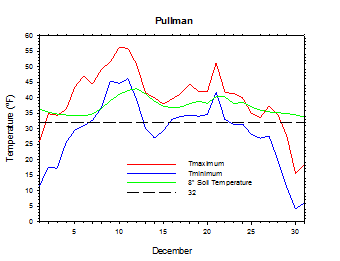 At month's end, Pullman dropped to 4 degrees on December 30th. Unfortunately, mountain snowpack showed little improvement during December, as there continued to be a mismatch between cold temperatures and precipitation. 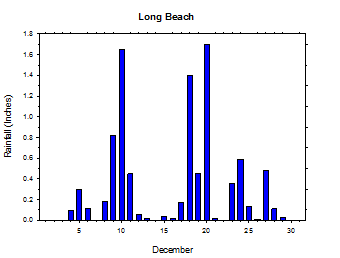 For example, Long Beach recorded rainfall on all but three days from December 4th to the 29th, since most of that time frame was stormy. However, these wetter periods which occurred just before and after mid month corresponded to the warmest days in December. High temperatures to begin December remained below freezing east of the Cascades, while lows dropped into the teens and even upper single digits. Western areas topped out in the 30s and 40s, although lows dropped well into the 20s. Steady warming occurred thereafter, and by December 10th, highs were in the 50s and 60s in many places, while lows were well above freezing statewide. Despite the modest cooling early in the period, temperatures around mid month were still above normal, with highs in the 40s and lows just slightly below freezing in the east. However, warmer temperatures returned after mid month. For the second time in December, much warmer temperatures arrived in the days before Christmas, as highs again climbed into the 50s, while lows remained in the 30s in the east and 40s in the west. However, conditions became much colder at the end of the month, as highs in the east fell into the 20s, with lows in the teens and even single digits. Meanwhile, western areas experienced highs in the 30s and 40s, with lows in the 20s. 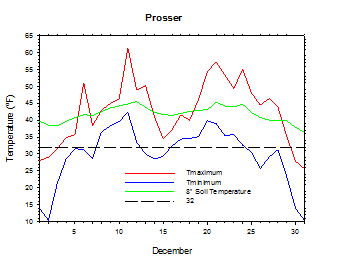 The average December temperature at Prosser (WSU IAREC) was 35.9°F, which is 3.6 degrees above average. The average high temperature was 42.7°F, which is 4.5 degrees (1.3 standard deviations) above average. The average low temperature was 29.9°F, which is 3.1 degrees above average. The maximum temperature recorded last month was 61.3°F on December 11th, while the coolest daily high was 25.7°F on December 31st. 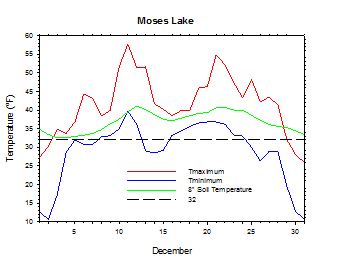 Low temperatures ranged from 42.3°F on December 11th to 10.4°F on December 31st. Daily average temperatures ranged from 50.7°F on the 21st to 17.4°F on the 31st. The monthly precipitation total was 1.09 inches. 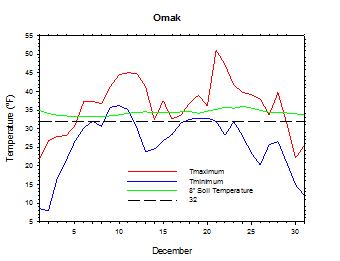 The average wind speed was 3.5 mph, and the average 8 inch soil temperature was 41.8°F. 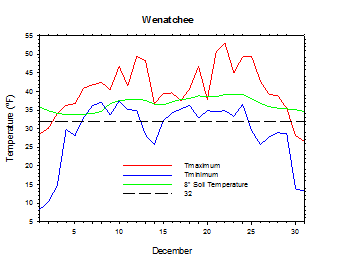 Wenatchee (WSU TFREC) recorded an average temperature of 34.1°F, which is 4.3 degrees above average. December 2nd: The temperature at Moxee plunged to 7 degrees. 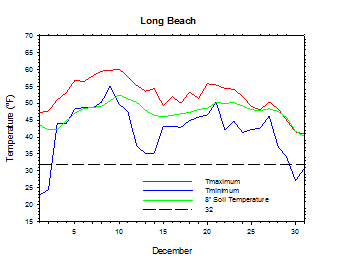 December 10th: 1.65 inches of rain fell at Long Beach. December 10th: The temperature at Mt. 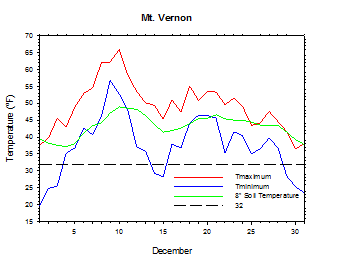 Vernon soared to a December record high of 66 degrees. 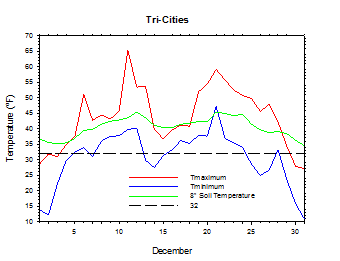 December 30th: The temperature at Pullman fell to 4 degrees. Growers in central Washington continue to wait for spring so that the extent of the damage, if any, caused by the mid November cold snap can be assessed. 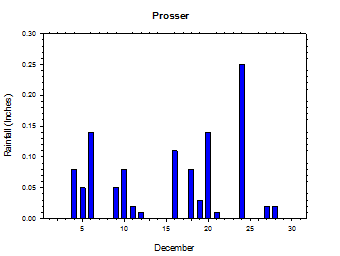 December was a mild time period overall thanks to very warm weather during much of the middle of the month. 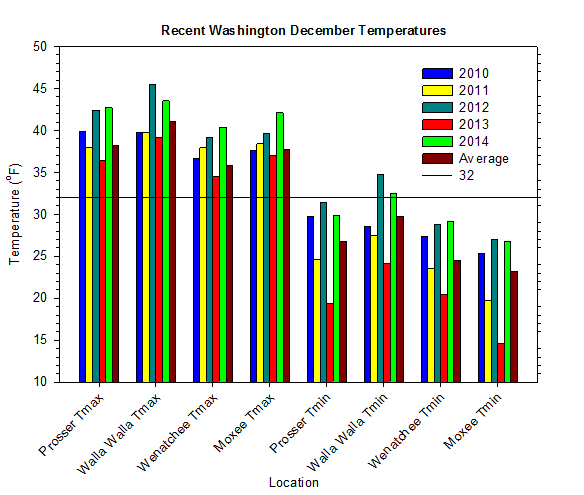 Even the cold temperatures at the beginning and end of the month were hardly unusual for December. 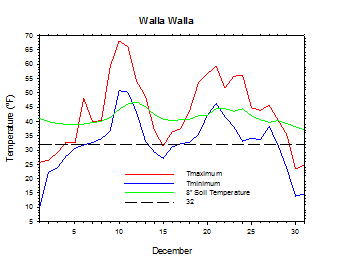 On December 8, 2013, the temperature at Pullman plummeted to -12 degrees. According to the Climate Prediction Center, above normal temperatures and below normal precipitation is expected for most of 2015. Borderline weak El Niño conditions persist at this time, although the atmospheric response continues to lag behind the clear oceanic signal.